Here is my tutorial which shows you how to make a wood pendant necklace. This is a great project. It’s quick, easy, and makes a beautiful gift. This wood pendant necklace is actually a gift for my wife, which is why I stained it purple. She loves purple. Enjoy. Wood pendant necklaces are becoming very popular. 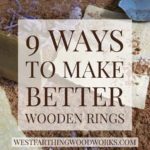 People really like to incorporate the natural look of wood into their style, and creative woodworkers are making some amazing designs. 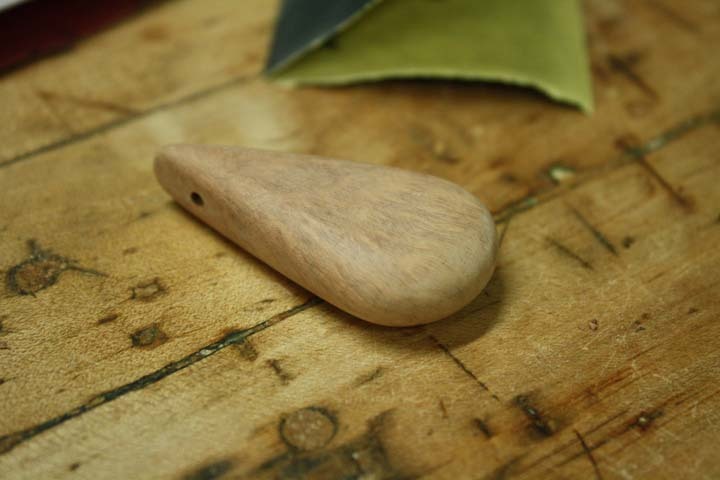 The most simple wooden pendants are made from a single species, and left natural. In this type of pendant, the natural beauty of the wood is the centerpiece. Following the instructions in this tutorial, you can make a pendant in that style if you like. There are also creative woodworkers using resin and casting pieces of burl wood. The resulting blank is then crafted into a pendant, and the beauty of both materials is shown. 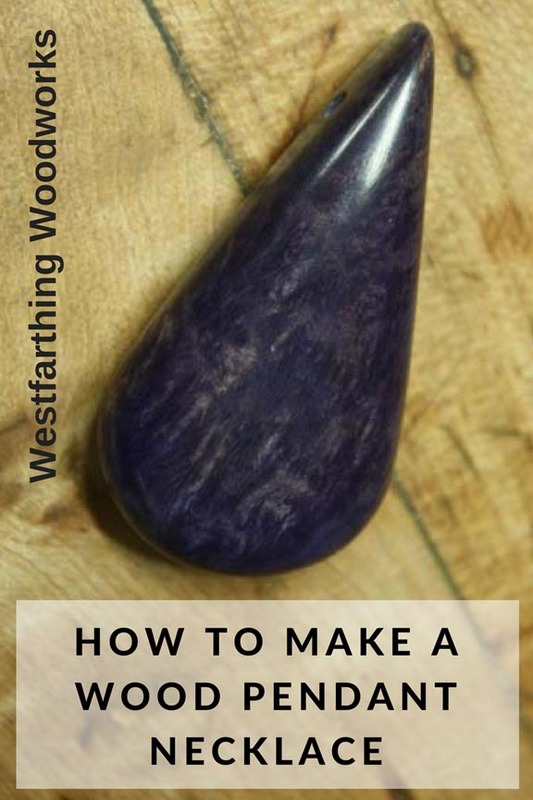 Once you understand the basic process of making a pendant in this tutorial, you will be able to apply that knowledge to a resin casting if you so choose. 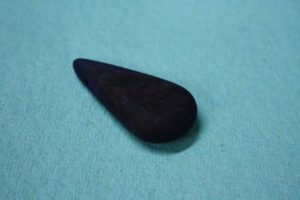 The beauty of this technique for making a wood pendant necklace is that you can use the same process on many different materials. You can also change the shape, design, and style if you like. The process will remain the same or similar. I really like working with Briar. 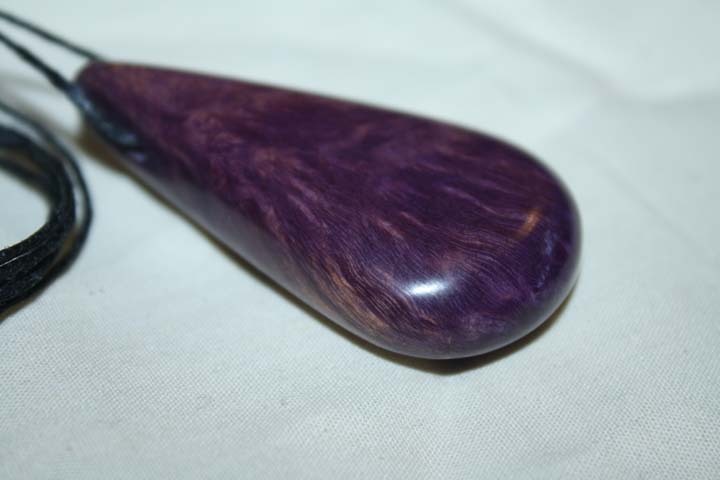 This is the premier wood for tobacco pipes, and it is incredibly beautiful. 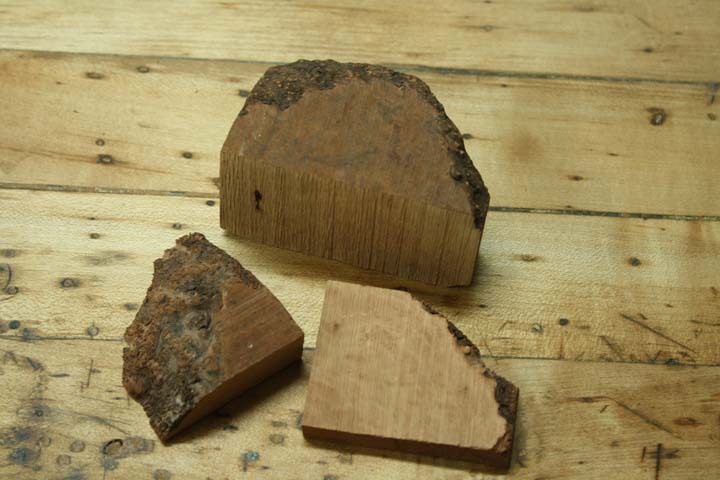 The picture shows a Briar block called an ebauchon, and a couple slices of Briar too. The pieces do not look like much right now, but after a stain and a polish they will look amazing. You can find Briar at a pipe making store, or a pipe making supplier online. Stores are becoming scarce, so you may just want to look online. If you do have a local place, they can help you select a nice looking block. It’s not cheap, but several wood pendant necklaces can be made from one block, reducing the cost. 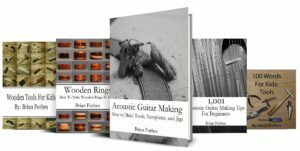 The benefit to buying Briar online is that it’s less expensive. There is a local place in my state that has Briar, but they only stock very high end pieces. These start around $40 for a piece about the size of a baseball. If you look online for a place like JH Lowe, you can get a deal on Briar for your wooden pendants. 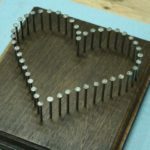 You can also make this project from a solid piece of wood. There are many beautiful species out there, and they can all be made into a nice necklace. If you are planning on staining the necklace, then I recommend a light colored species. For these instructions, I will be using Briar. Sand the bottom of your Briar block until you have a smooth surface. This does not have to be perfect. Use a belt sander or a power sander to get through the rough exterior surface of the Briar. Once the wood grain is exposed, you can read it better. Now, wet the surface with water. A few drops spread around with the fingers will do. Once the piece is wet, you can begin to see what Briar really looks like under a finish. This is your opportunity to read the grain, and incorporate it into your design. 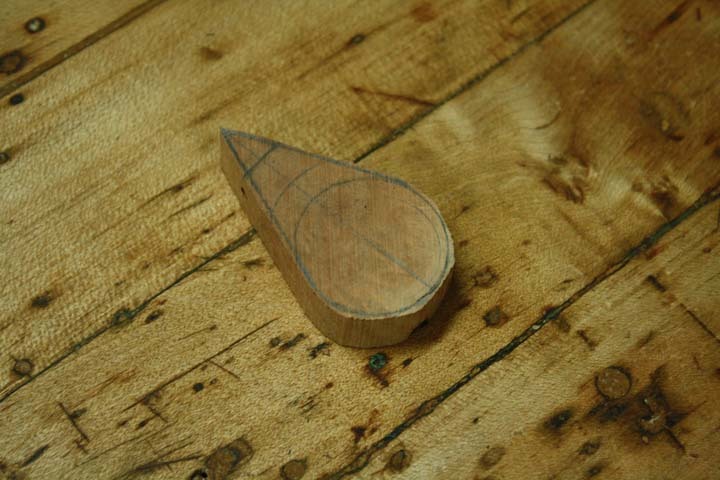 Since this is a teardrop design, plot out your shape so that the direction of the grain flows well with the shape. 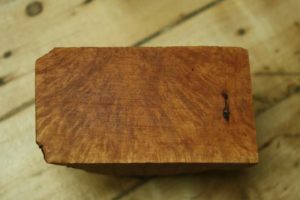 Saw off a slab off the bottom of the Briar that is 3/8 inch thick, which you will use to mark out the shape of your pendant. If you like something a little thinner, then you can sand it down or cut a thinner piece. 3/8 inch is pretty good, because it’s thick enough to handle but not too bulky to wear. Mark a line through the grain pattern than will be your center line. Base the decision on how the grain looks. Then, draw a 1 inch diameter circle on the most figured end. 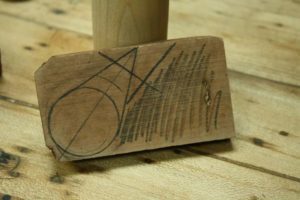 About 2 inches away, draw a couple straight lines that form in the teardrop shape. In order to drill the wood pendant, you need to create a flat surface and a drilling line. Make a line perpendicular to the center line that is about 3/8 inch away from the tip. This will be the hole for the necklace string. Then draw another line parallel to the center line and on the right. This is the flat section that will help you drill through the pendant before you cut it out. In this case, cut out the shaded portion on the right. 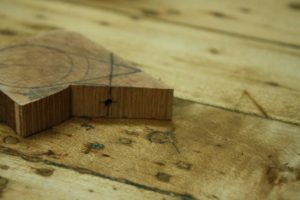 Once the piece is removed, you have a flat area where you can drill more accurately. Extend the necklace string line around the end of the wood, and then mark the center. Use a 1/8 inch drill bit to drill carefully through the necklace. Make sure to keep the drill straight, and you will see it pop out of the other end right on your line. If you get the hole a little off, don’t worry about it too much. You can sand out the shape a little extra and minimize the mistake. If you drill it terribly, consider marking out another pendant and giving it a second try. After the hole is drilled, cut out the remainder of the wood pendant shape on the saw. 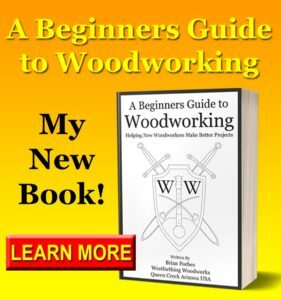 If you have a band saw, this process is very quick. If not, use a hand saw and take your time. Make sure to stay outside the lines when you cut out the pendant. The shape will be refined later on with a sander, so leave a little material to work with. When in doubt, leave a little more versus trying for too much and altering the design. This is a small pendant, so if you dig into the design with the saw, you may need to remove too much to even it out. Initial sanding is done on the belt sander. Refine the shape of the edges only at this step. I recommend that you sand the flat sections first, and make them even. 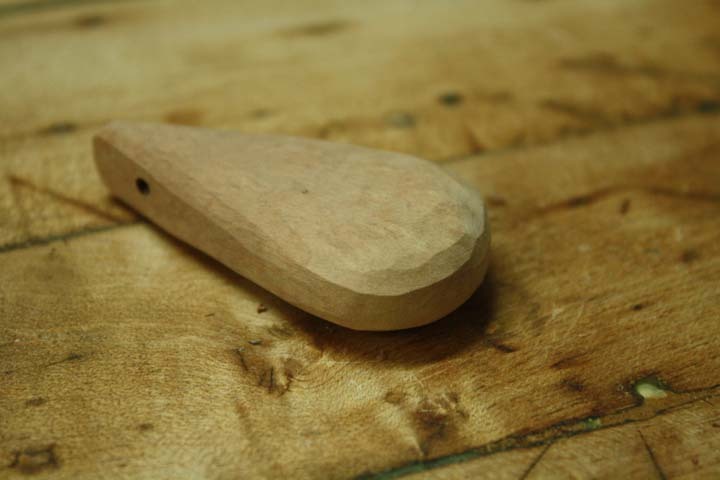 Look at the wood pendant regularly, and only stop sanding once the two flats are even from both sides. Now, begin refining the shape of the round portion on the bottom. Work carefully, and sand the profile to blend it into the flats. It is far easier to get the flat areas right and then do the rounded area. If you do it the other way, you will end up sanding the round area a second time after you make adjustments for symmetry on the flats. 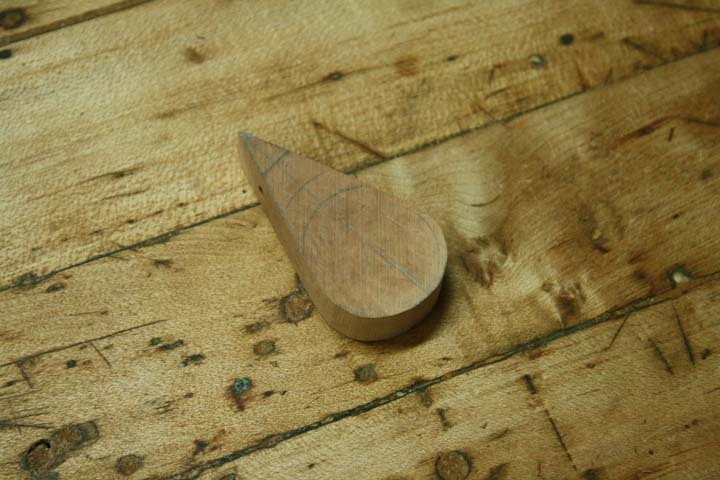 Once the shape looks nice, and the edges are sanded, move on to the next step. Now that the basic shape is set, the piece needs to be carved and sanded to make it more rounded. The easiest way to do this is on a belt sander or a spindle sander. For my Briar piece, I used a 2 inch spindle sander with 100 grit paper. Work slowly and carefully to round over the corners all the way around the wood pendant shape, and blend them. The first few will take off a large amount of material, since the corners are going away. The amount of rounding is up to you, but I recommend removing quite a bit so that the pendant has a pleasing shape. Once you have the basic shape created on the power sander, switch to sanding by hand. Start with 150 grit paper, which will remove material quickly. 150 grit is also nice because it does not leave really deep scratches. Start by evening out any really rough areas, and blending them into each other. Spend as much time as you need with the 150 grit paper, and resist the urge to switch to finer papers before you are ready. 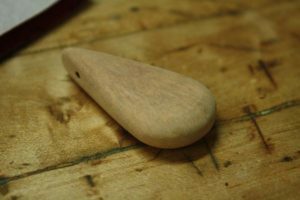 It will take quite a bit of sanding to get your wood pendant necklace smooth enough to switch grits. In fact, the closer you can get it at this point, the better off you are when you switch to 220. Hopefully you followed my advice from about 3 seconds ago and stayed with the 150 grit paper until the shape was perfect. If you did, this next step is going to fly by. 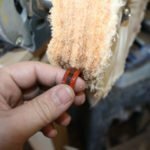 Switch to 220 grit paper and go over the entire wood pendant. Wipe it off, and go over it again to remove all the scratches from the 150 grit. After the scratches are gone, switch to 400 grit paper, and go over the piece again. After some sanding with 400, the piece should be incredibly smooth. At this point, wipe it off and check the surface for scratches. If you find any, remove them with the finest paper possible. My wife loves the color purple. So, there was no other color that I could use for this project. 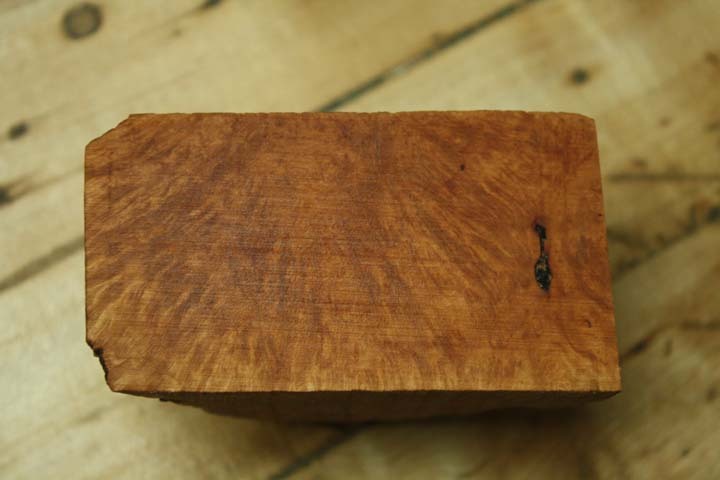 One of the best ways to stain wood, especially Briar is by using a dye stain. This color is a Trans Tint Purple, which I mixed with Denatured Alcohol. Apply several coats. This type of stain dries very quickly, in a matter of seconds. Blow on it between coats. This makes the finish dry in a single breath, and you can wipe on another coat. I applied about 30 layers of finish to my wood pendant, and then blew on it for a few seconds to set the color. If you do not want to use a dye stain, then use a stain of your choice or leave the project natural. Briar is best finished by polishing. 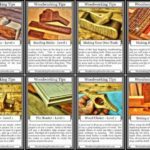 I use the Beall Wood Buff System, which I have another post about. If you are finishing this piece with a hand applied product, take a look at my article on Tru-Oil for great directions. I buffed this wood pendant necklace with tripoli compound, and then white diamond. The buffing wheel smooths the surface of the wood, and adds a shine. Nothing was added afterwards, and the shine is from the polish on the wood. If you have never buffed wood before, I recommend trying it some time. Once you do, you will end up buying the system pretty quickly. It’s only about $100 too. The last thing you need to do is run a string through the hole in the wood pendant necklace, and tie off the ends. You can also buy a nice necklace and thread on the pendant. For mine, I used a piece of black waxed cord, which has a rustic look. If you have any questions on How to Make a Wood Pendant Necklace, please leave a comment and I will be glad to answer them. 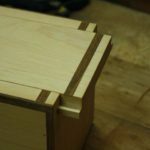 Also, please share my work with your friends online so that I can show more people the joys of woodworking. Happy building.